Time for another year’s “State of the WIST” post. I last ran this report a year ago. What’s happened the last year? I made visible the quotation “topics” field, etc., which I’ve been adding for 2+ years now on new quotes (and backfilling on quotes that I edit). I’ve also been adding topics to the most popular quotations in the database. I’ve started adding a meme / graphic to at least one quotation a day, using PixTeller. These have been pretty popular (in terms of views), though I haven’t seen any “in the wild” yet. I also have been backfilling graphics on the most viewed quotations in WIST. I have extended the author pictures to all of them with at least four quotes in the system; all new authors get a picture, of course, and as I add quotes any for existing authors without a picture, I add it. I added in a plug-in to show “possibly related quotes.” If nothing else, I’ve found it useful in spotting duplicates. So continued progress. Generally speaking I post five quotes a day, every weekday. Sometimes I miss a day, but rarely (being unemployed helps with such projects). I’ve also combined duplicate quotations as I’ve found them. Note that, as always, all of these are curated to some degree or another — digging out citations when possible, finding author photos, etc. No mass uploads for me. Of the authors I have, who are the most quoted in WIST? 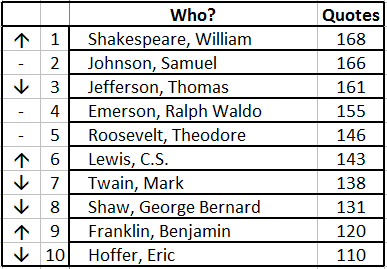 I had nobody new on the Top 10 Quoted Authors list this year, just some shuffling around within the stats, with Shakespeare pulling ahead of Jefferson again. Runners-up (Bertand Russell, Winston Churchill, John F. Kennedy, Thomas Fuller, Abe Lincoln) are all within spitting distance of getting on there if I run across a good source of unused quotes for them. The Top Ten Author list is shown “live” in the sidebar (“Prolific Authors”). Some overlap there, as you might expect, but definitely some up and comers from some more recently added quotations. Google Analytics shows me my traffic was flat this year — a precise match for the stats last year — with each day 32 visitors making 37 visits and viewing 51 pages. I have another 19 people who get a daily email (via FeedBurner) of WIST content. Over in social media, I’m posting to Twitter (112 followers, up from 92), Facebook (25 likes overall), and Google+ (26 followers). The social media aspect hasn’t taken off as I’d hoped, but, honestly, I’m not doing this (mostly) for the publicity. Though it would be nice. Tell your friends! Age-wise, the biggest cohorts are 18-24 and 25-34 (a bit over 20% of the sessions each); the 55-64 cohort is at around 17%, and the other cohorts are roughly equal. In gender, 58% of the visitors are female. 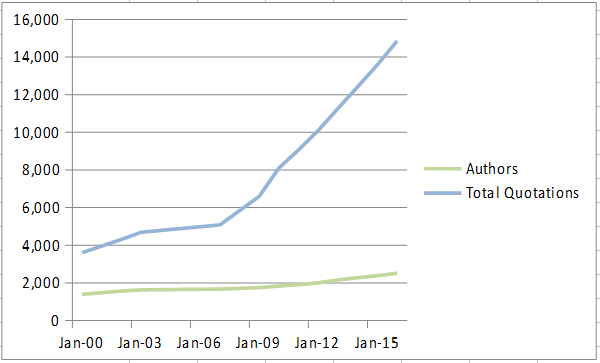 87% of visits are by English-speakers; no other cohort gets above 1.2%. Nationally, 63% are from the US, another 7% from the UK, with India, Canada, and Australia rounding off the Top 5. 44% of visits here over the last year used Chrome, 20% Safari, 15% Firefox, and 14% IE. 54% were Windows users, 19% Mac, 13% iOS, and 10% Android. Doing another swing through the authors to give pictures to all who have at least 3 quotes. Do another “are they dead yet?” sweep of the authors. I’m beginning to get an itch to redo the blog design. We’ll see. The biggest question mark I have is how changing to being employed (whenever that happens, soon I trust) will change stuff. I may need to change to posting in the evenings, and the graphics may end up being reduced in number. We’ll see. And that’s the end of the annual report. See you next March!